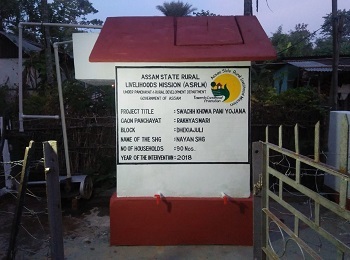 “Swatch Khowa Pani Yojana”- in an initiative of Assam State Rural Livelihoods Mission (ASRLM) under the Social Development component to provide low cost clean and safe drinking water to the community especially in tea garden areas of Assam. Unhealthy ways of life and improper food and drinking water habits often lead to diseases which incur a lot of expenses hence bringing a burden to poor households. Initiative to provide low cost clean and safe drinking water to the community especially in tea garden areas of Assam. 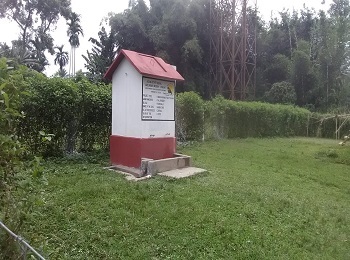 Low cost Water Purification Units are set up in villages/labour lines of Tea Gardens. Initially this project has been started with 34 Tea Garden areas of Sonitpur and Biswanath District by installing one unit per Tea Garden. These units are community managed, specially by the SHGs promoted and strengthened under ASRLM residing in these tea gardens. ASRLM has initiated this project in collaboration with respective Tea Garden Management and Terafil. Once the unit is set up; the selected SHG will make a monthly roster/time table on assigning day wise duty to its SHG members. Drinking water may be taken twice a day (morning & evening) only. The time will be decided by the SHG and community as per their convenience. A portable water pump will be provided to the unit by the Mission in the pilot intervention. The President or Secretary of the selected SHG will be the custodian of the portable pump. Loss of the pump will pertain to payment of the amount by the President or Secretary. Assigned SHG member (including President or Secretary) will have to deposit the pump after completion of her duty, on daily basis. The SHG will open the gate only during the set timings. Maintenance cost for first one year is inclusive of the expenses for unit set up. Later years, the community will have to pay a minimum self-decided amount per household every year to the SHG/ Water Management Committee for maintenance expenses, repair work, payment of services etc. The SHG/ Water Management Committee may obtain grant/free assistance to cover repair costs of the unit from Tea Garden management, private, religious or non-governmental organizations. The SHG/ Water Management Committee need to keep separate cash book for this Operation & Maintenance Fund. Tea Garden Management Authority will provide a fencing (either bamboo of iron made) around the unit. As and when required, the SHG/ Water Management Committee will inform Tea Management/BMMU for hands-on training or repair or support. In case of any other management and water use conflicts also, the SHG/ Water Management Committee will report to Tea Management/BMMU. The Tea Management/BMMU is responsible to consult unit installation Agency/Welfare Officer/ PHED Dept./Hygiene expert/Jeevika Sakhi or any other concerned to obtain any support as and when required by the SHG/ Water Management Committee. The SKPY Committee is responsible for overall monitoring of functioning of the units. The Committee will visit each unit and responsible SHG at-least on monthly basis. In case, if an SHG wants to withdraw, the SHG itself should propose another nearby willing SHG to take the responsibility to SKPY Committee. The withdrawing SHG must return the portable water pump and balances (annual collection from community), if any, to the new SHG in presence of the SKPY committee. In case, there is no existing SHG, either new SHG will be promoted or Water Management Committee will be formed for overall management of the Unit.